The following is a collection of several excerpts from the impressive project, “Unequal Scenes,” created by the photographer Johnny Miller. Miller produces aerial imagery of urban inequality, is a Code For Africa news fellow, and a founder of africanDRONE. Inequalities in our social fabric are oftentimes hidden, and hard to see from ground level. Visual barriers, including the structures themselves, prevent us from seeing the incredible contrasts that exist side by side in our cities. Unequal Scenes uses a drone to illustrate the inscribed history of our world in a new way. The scars within our urban fabric, so apparent from above, can provoke a sense of surprise (“I didn’t know it looked that bad!”)…But also reveal our complicity in systematic disenfranchisement. 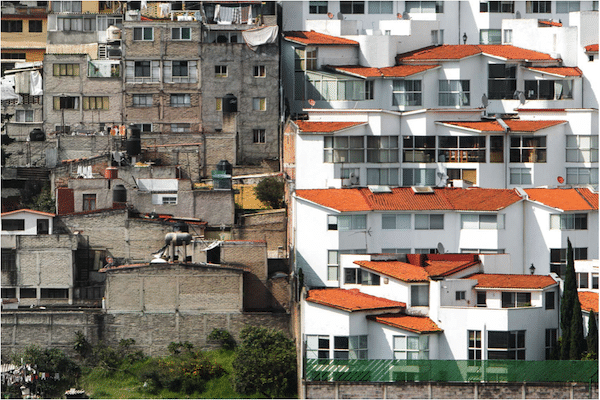 We live within neighborhoods and participate in economies that reinforce inequality. We habituate ourselves with routines and take for granted the built environment of our cities. 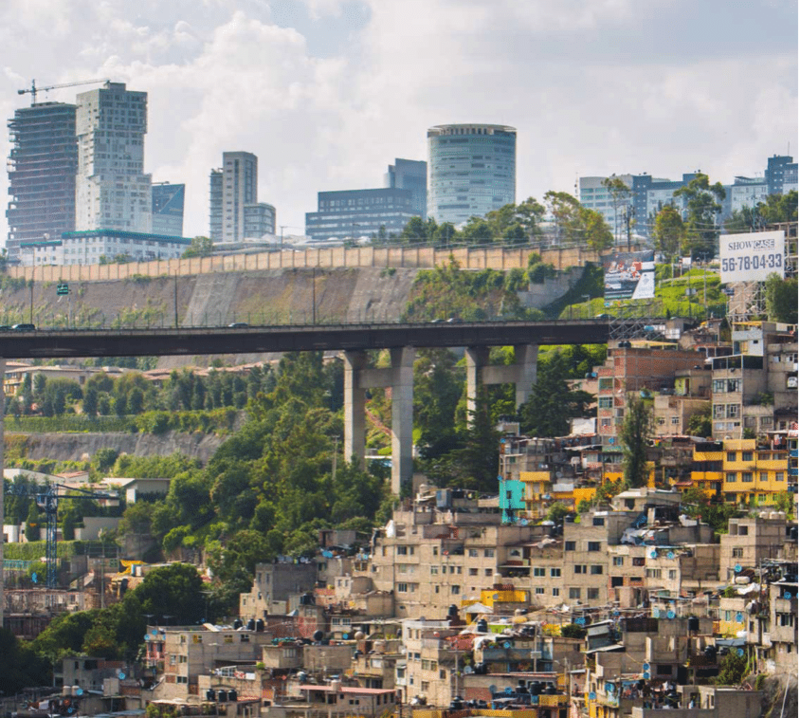 We’re shocked seeing tin shacks and dilapidated buildings hemmed into neat rows, bounded by the fences, roads, and parks of the wealthiest few…But it’s the very scale and unerring regularity across geographic regions which points to the systemic nature of inequality. This is not organic–this is planned and intentional disenfranchisement. By placing a non-human photographic actor–in this case, a remote-controlled drone–above these liminal spaces, a new vantage point is reached, previously reserved for the government and the very rich. The drone distances the photographer and the viewer of the photograph, both physically and mentally, and provokes an analysis of the distant gaze. It forces us to confront the ethics of representation, and the limitations (and freedom) of using technology in image-making. How far does the drone need to be from the ground in order to reach an “ethical” altitude? Who should have access to the airspace and to the drone technology? Are drone images fundamentally different than a Google Earth image or a printed map? Make no mistake–Unequal Scenes is an act of defiance. I defy the traditional power structures that keep these inequalities hidden so well from every direction except directly above. If the images provoke uncomfortable feelings of fear, despair, or an unsettling realization of complicity–good. They are intended to. It’s built on a slender, impossibly crowded peninsula surrounded on three sides by water. It contains the heart of India’s most powerful industries, and some of its poorest slums – it’s an urban jungle, a vertical aerie for the superrich, and a fragile marine ecosystem. 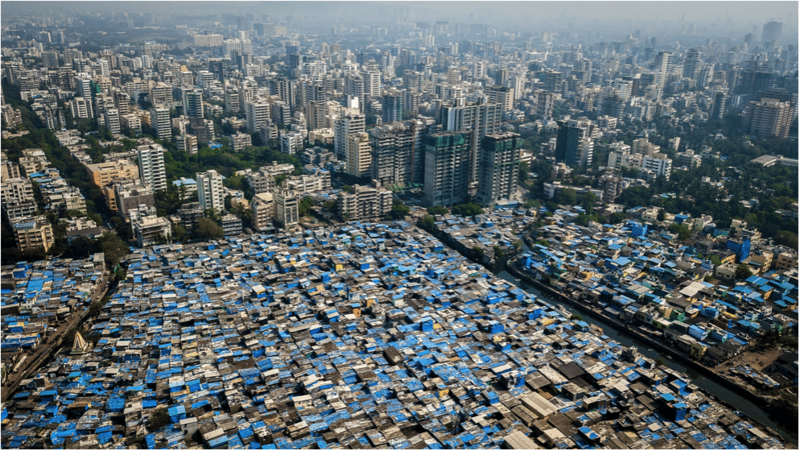 Billion-dollar houses in the form of skyscrapers exist next to vast slums covered in blue tarps against the monsoon rains. Informal recyclers in Dharavi exist within sight of the National Stock Exchange, traditional fishermen moor their boats in the shadows of skyscrapers in Worli, and leopards prowl the Sanjay Ghandi National Park on the city’s northern flank. In short, it’s a city of contradictions. Even the new airport is stunted, India’s second busiest, with the east section unfinished and a second runway impossible to build because of the slums which encircle the airport from all sides. A modern subway system is being dug below ground, while above the streets heave with every form of conveyance in a vast cacophony of horns blaring. 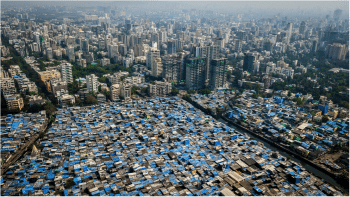 Love it or hate it, Mumbai is a model of the city in the 21st century-A Global South alternative to Manhattan, an awakening elephant in the fields of culture, science, industry, and architecture, and also a thoroughly in-progress, semi-planned experiment of extreme growth. Mexico City is a bustling, enormous, modern city, one of the largest in the world. Triple-decker highways and gigantic tunnels bore through the mountainous terrain. Towering skyscrapers, enormous cathedrals and one of the world’s largest squares sit impressively atop a gigantic drained lake. Everywhere there are signs of the Aztec empire which came before – in the street names, the festivals, the food, and the eyes and skin of the population. It is truly one of the most fascinating cities I’ve ever been to. Mexico is also one of the most unequal countries in the world. At one point, the world’s wealthiest man was a Mexican. The wealthiest 1% of the population earns 21% of the nation’s total income, a percentage higher than any other country in the world. Significantly, much of that wealth is concentrated in just a few multimillionaires. By some measures, the top 4 richest men in Mexico concentrate 9% of the wealth, a staggering amount in a country this large. Johnny Miller is the photographer and drone flyer for Unequal Scenes. The uneasy U.S.-China relationship: what lies ahead?